If you are looking for New York clowns, clowns in Westchester NY, Fairfield County CT, or Bronx clowns, Sunny the Clown of Yonkers enjoys providing family entertainment at kids parties, such as birthday parties, for children of all ages in a safe and caring atmosphere. 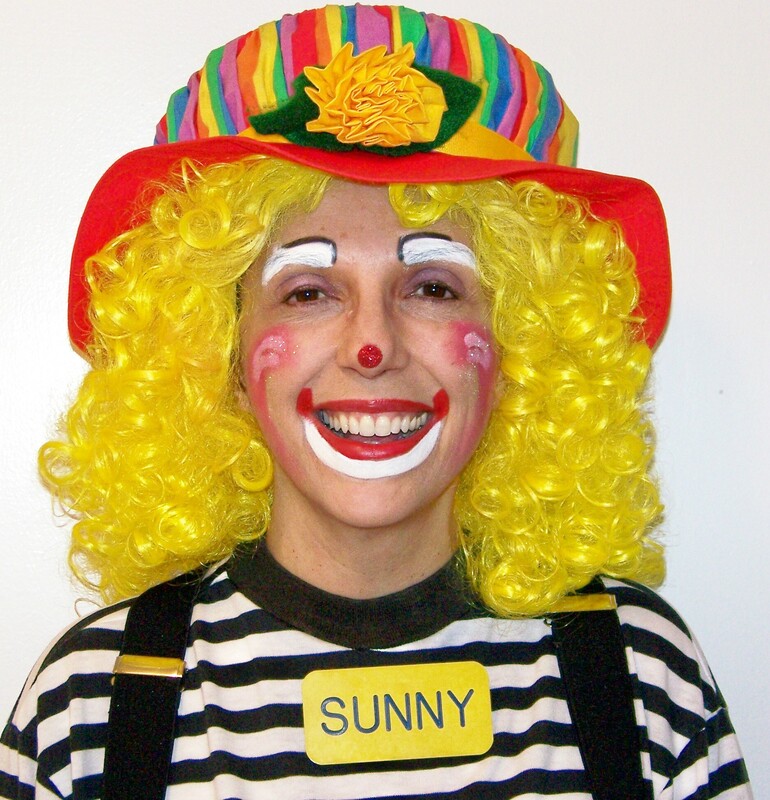 As a children's entertainer, Sunny the Clown modifies each performance to be age-appropriate. Activities are designed to be non-competitive and as inclusive as possible. Facepainting designs are created to please the the child who is being painted. For example, younger children prefer facepainting to be done on their hands where they can view the design. Facepainting on younger children is simple and quick because it is difficult for them to sit without squirming. As a party clown, Sunny the Clown is a children's entertainer first. Puppets, tattoos, and balloons are tools that she uses as part of the process of entertainment. Her comedic and playful personality is evident during her puppet and magic show. Children and adults alike sit captivated as they giggle and belly laugh at her antics. When you call Sunny to inquire about a kids' party or corporate event Sunny the Clown will take the time to talk with you with your best interests a priority, so that your special event is BIG FUN FOR EVERYONE! Sunny the Clown taught in the New York City Public Schools for many years as a high school physical education teacher. She has coached sports teams for many years, in the school system and as a volunteer in Yonkers. She has also been involved as a Sunday School teacher, a Cub Scouts den mother, and an active member of the PTA. Sunny the Clown received her initial training at the Mooseburger Clown Camp in Minnesota in 2001 and continues her professional development by attending workshops and conferences throughout the year. As a New York clown she is fully insured and is an active member of Clowns of America International and the World Clown Association (WCA). In 2006, she was honored by the WCA with the coveted BO Dino Scholarship, a national award which is given to ten individuals annually. Gigmasters, a national agent, awarded Sunny with the Rising Star Award twice, for being the most sought after clown in North America, in 2007 and 2008, on their national website. In 2009,Sunny was featured on the front page of The New York Post, the Lo Hud Express, in the local section of The Journal News, and written up in the business section of the New York Times. You may have heard her interview on WVOX and her name mentioned on WCBS AM radio as the clown who was selected to be sent to Albany to "join the circus" during the state senate fiasco in June.